Adding your Formlets form to your wordpress site is easy. Follow these few easy steps and then your form will be attached quickly. First, you will have to log in to your Formlets account and go the form you want to add into your website. There are 3 steps provided when you wish to integrate your form, just click on "Share and Integration" button to view these steps. 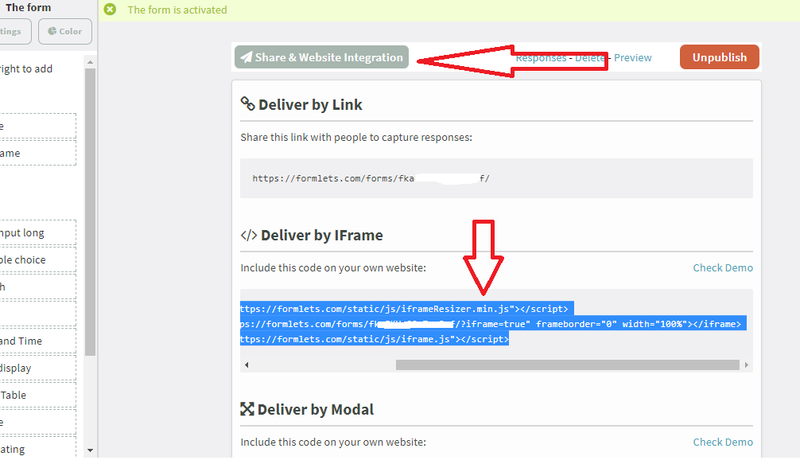 Among the three, choose "Deliver by Iframe" and copy the code provided. On your wordpress site's dashboard, Go to "Pages", click "Add New" and on the text box shown, paste the code from Formlets. After that, you may want to click preview first to check on your page. When everything looks good, you can now click "Publish". Refresh your site and check on the page you have just attached your form. Congratulations! You just published your form in your website.